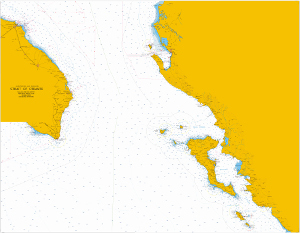 To complement the GPS plotter there are several paper charts to consider. The best known publications - certainly on the charter yachts, request reliable yacht charter companies - are by Imray: two passage charts, the M23 Adriatic Sea Passage Chart and the M30 Southern Adriatic and Ionian Seas, as well as four cruising charts: M24 Golfo di Trieste to Lošinj and Rab, M25 Otok Rab to Sibenik, M26 Split to Dubrovnik, M27 Dubrovnik to Bar and Ulcinj. See the Imray section below. 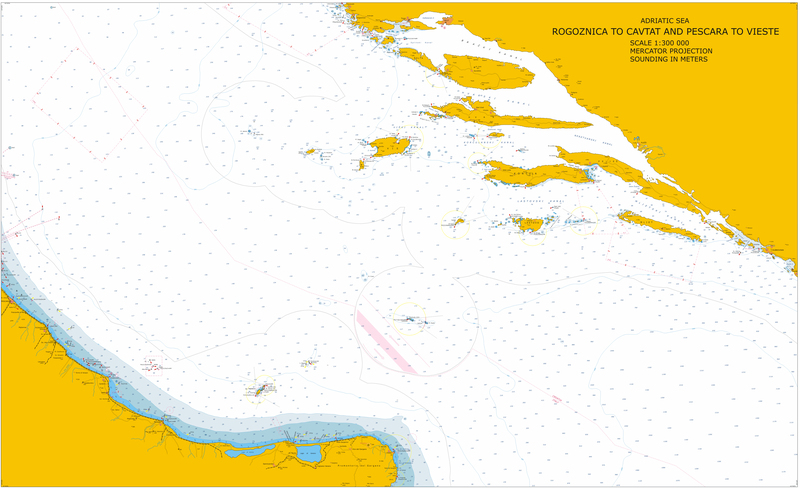 British Admiralty charts - though more expensive - offer much more details since printed in larger formats and in larger scales too. These ten BA Charts are recommended: 2719, 202, 515, 2711, 2774, 2712, 1574, 1580, 1582. 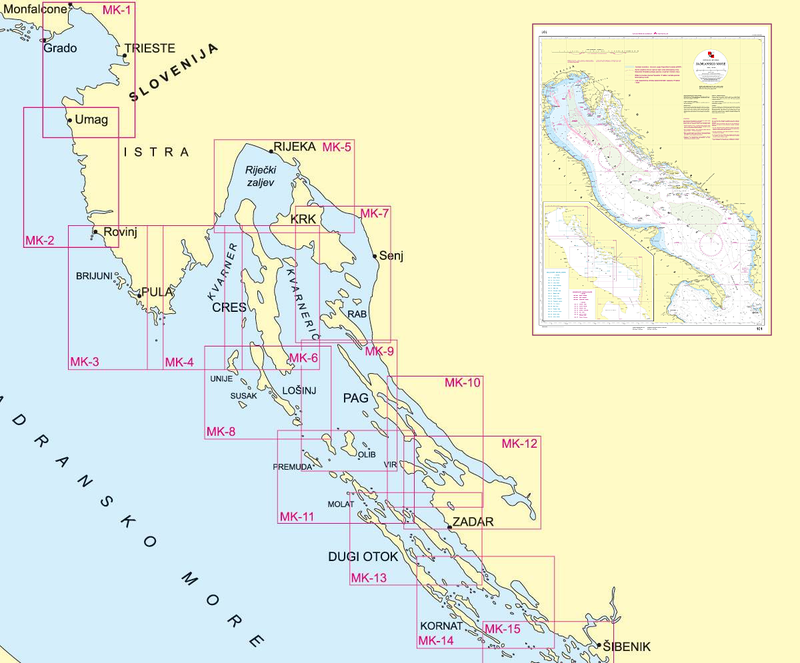 The Croatian Male Karte sets 1 and 2 likewise offer larger scales and more details than Imray. Male karte means “small charts”. The nautical charts are not for navigational purposes and numbers 11, 12, 28 and 29 are unavailable. If a lighthouse shows the abbreviation POT in a marked area, it means POTAMJENO. It is the Croatian word for ‘not visible’. 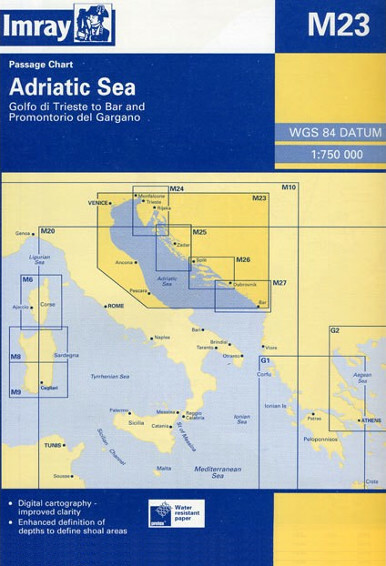 this shallow western shore of the Adriatic Sea is mostly very wearisome, with hardly any picturesque or worthwhile ports. 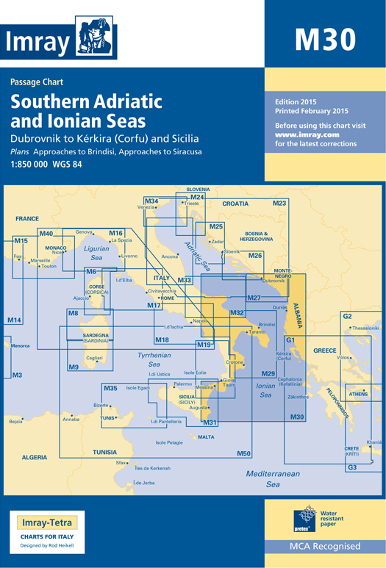 Notable exceptions are — from south to north — The medieval harbour of Otranto, Monopoli (south of Bari), Molfetta (north of Bari), Trani, Manfredonia, anchorages in the nature reserve of the Tremiti islands and the river harbour of Cesenatico. 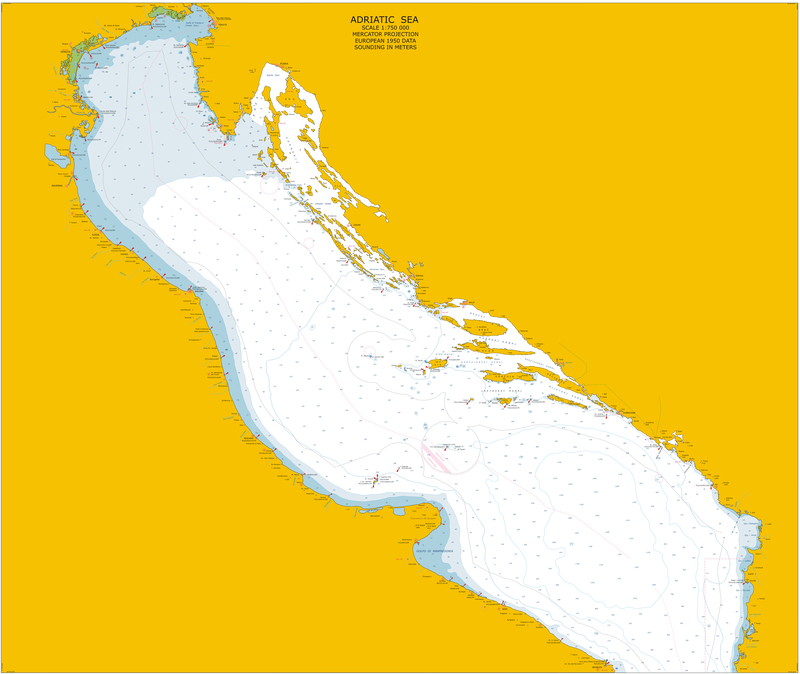 this northernmost part of the Adriatic is uncomfortably shallow, with many ugly marinas to avoid. Do visit Muggia, Grignano (Miramare castle), Duino, Laguna di Marano, Laguna di Grado and of course Trieste and Venice. the tiny stretch of coastline south of Trieste with just three must-see ports; Piran, Izola and Koper/Capodistria. a much indented coast with a myriad of islands and isles → the epitome of cruising grounds only surpassed by Greece and Turkey. 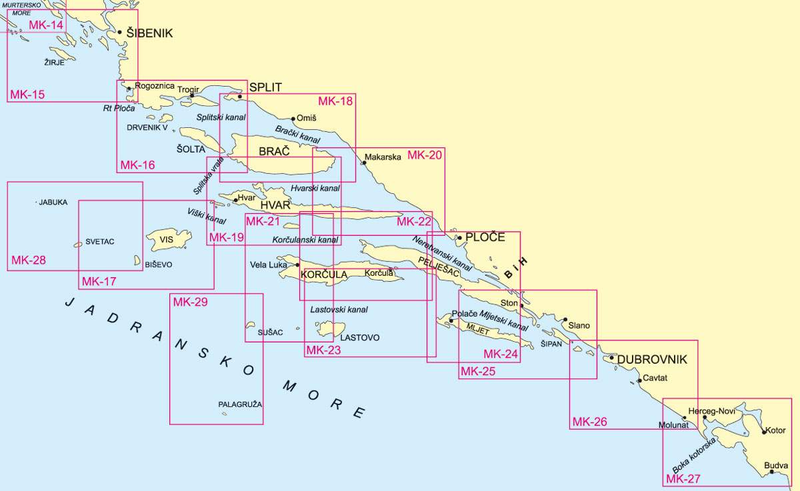 a small but lovely area with ports like Petrovac na Moru, Sveti Stefan anchorage, Budva, Bigova, Kotor and the Kotor Gulf. this country - adjacent to Corfu - is avoided by all but the most adventurous sailors. 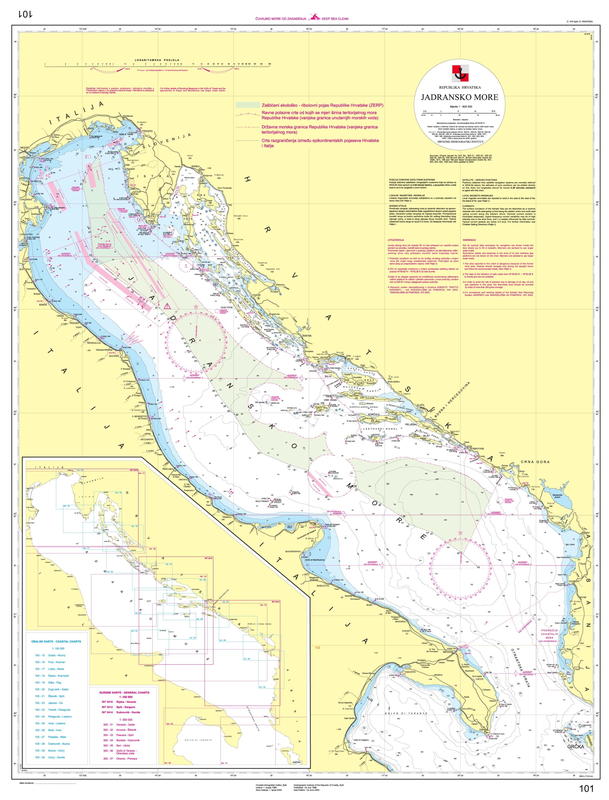 The Dalmatian coast — located on the eastern shore of the Adriatic Sea — stretches from island of Rab in the north (Chart MK 7) to the Bay of Kotor in the south (Chart MK 27) in Montenegro. 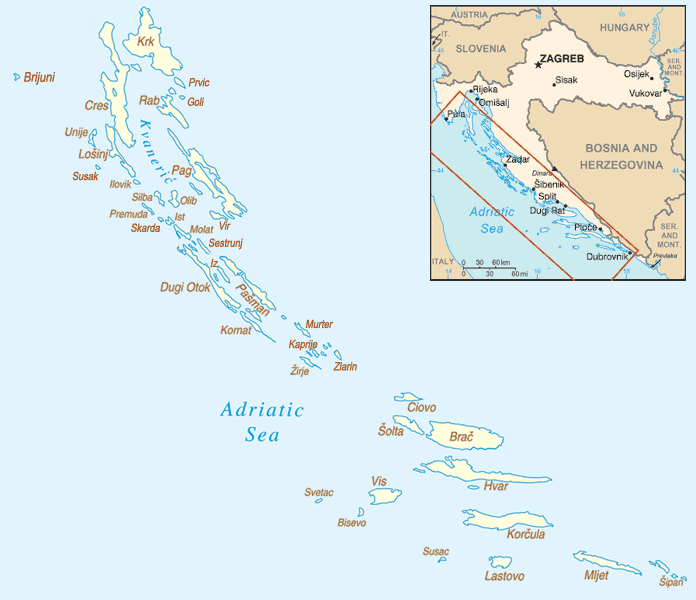 Not only the coastline of Croatia, with important ports like Split, Zadar, Dubrovnik, and Šibenik, but also ~80 larger islands (largest being Brač, Pag and Hvar) and hundreds of smaller islets make up the Dalmatian coast. For sailing holidays, focus on the coasts and islands between the ports of Venice and Bar, which includes the Dalmatian coast! 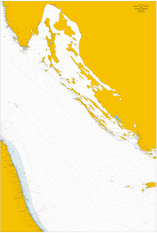 Reliable bareboat yacht charter companies for Croatia — monohulls & catamarans. 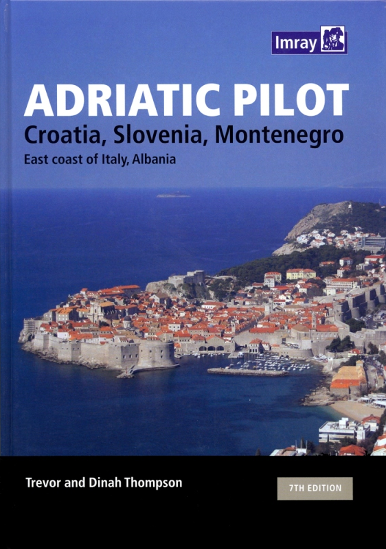 Luxury crewed charters & gulets in the Adriatic and Croatia. 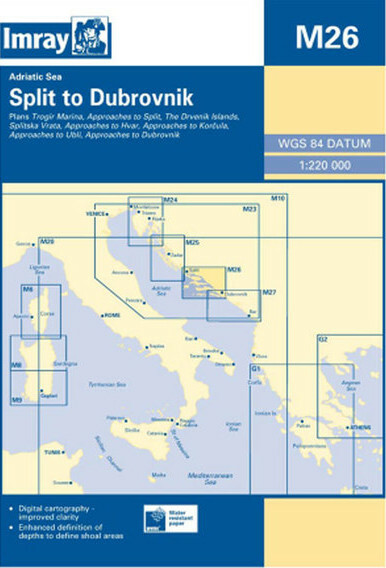 For other Mediterranean sailing areas: Greece and Turkey. 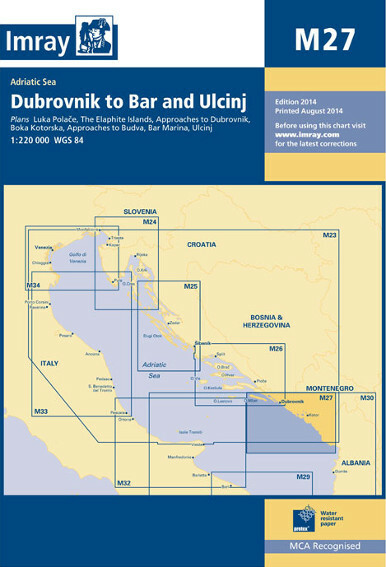 Important ports along the east Adriatic seaboard — from SE to NW — are: Bar, Budva, Kotor, Zelenika, Dubrovnik/Gruž, Kardeljevo/Ploče, Vela Luka, Korčula, Ubli, Komiza + Vis, Hvar, Stari Grad, Split, Šibenik, Zadar, Sali, Primošten, Božava, Mali Lošinj, Pula. This Imray Chart is one of two passage charts for the Adriatic.